This storytime happened on Leap Day, so I decided to take an unusual day and do an unusual theme. 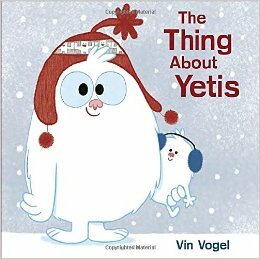 When I taught middle school, Leap Day stood for Let Everyone Act Peculiar, and my "peculiar" theme for this storytime was Yetis. Five fuzzy Yetis sitting on the floor. The first one said, "Let's knock on someone's door." The second on said, "Let's act a little scary." The third one said, "Why are we so hairy?" The fourth one said, "I hear a funny sound." The fifth one said, "There's no one else around." So five fuzzy Yetis hid under the bed. Song: "If You’re Happy and You Know It"
Craft: I also had a very unusual craft this week. I won't have a Monday night storytime on Leap Day again until 2044, so I crocheted yetis to give to the kids, and their craft was a Yeti Adoption Booklet that I created for them to draw a picture of their yeti, give him/her a name, etc. I definitely won't do something like this every week, but just this once it was fun to give the kids their own unique plushie to take home with them. McGovern, Cammie. A Step Toward Falling. HarperTeen, 2015. Emily and Lucas crossed paths when they both witnessed a classmate being attacked at a football game and chose not to assist her. They are now earning community service hours by assisting at a center for adults with disabilities. Meanwhile, Belinda, who was able to fight off her attacker, is at home, too afraid to return to school. Emily thinks all football players (like Lucas) are dumb jocks, while Lucas is too proud to come down off his society-imposed pedestal to interact with lowly Emily. Somehow the two of them must work together to apologize to Belinda and make things right. 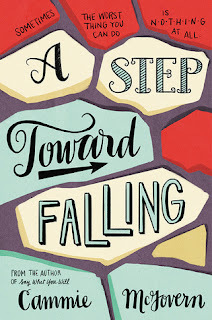 I am glad for another book featuring a protagonist with a disability, and I appreciated the way Belinda stood up for herself and was able to return to school, in spite of her grandmother's objections. I am glad for the punishment Emily and Lucas received and that they were able to learn about a different segment of the population and grow to feel compassion for them. The whole "we're going to put on a play at the last minute and it will totally work and be awesome" idea was ridiculous, but probably exactly the type of thing teens would think would work. I saw the obvious connections between Belinda's obsession with Pride and Prejudice and Emily and Lucas's relationship, and it was an interesting addition. I didn't love this book, but I do like it. I like to include nonfiction titles wherever appropriate. 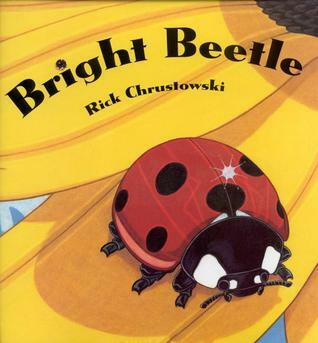 The kids at storytime enjoyed comparing the life cycle of a ladybug to that of a caterpillar, which they were already very, very familiar with. On my toe is Freddy Flea. Now he’s climbing up on me. On my head where my hair grows. Now he’s climbing down on me. On the floor. Goodbye, flea! 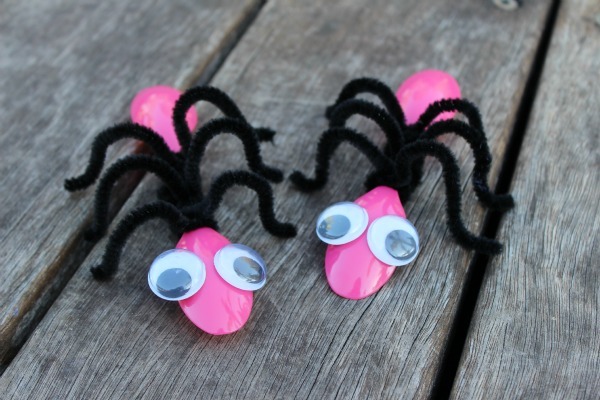 Craft: Spoon Bugs! Plastic spoons, pipe cleaners, googly eyes, and glue or glue dots, all of which probably already exist in your library at this moment. I love that there is lots of room for variety in this craft. I saw spoon ants, spoon spiders, spoon caterpillars, and even a spoon butterfly! A slice of life novel that would make an excellent beach read. Tamaki, Mariko. 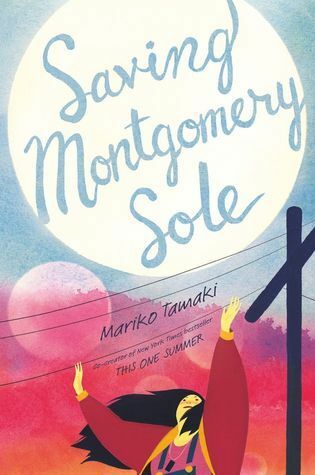 Saving Montgomery Sole. Macmillan Children's, 2016. Montgomery Sole lives with her sister and her moms in a small California town. Everything is fine until the famous preacher and his son move into town. The silent son is in many of Montgomery's classes, but she is just waiting for the other shoe to drop. When will he decide he needs to save Montgomery and her family? The above paragraph made it sound like this book had a plot, but it really doesn't. The preacher's boy never does anything harmful or hurtful to Montgomery, and really, nothing happens throughout the 240 pages of this book. Yes, Montgomery has two moms, but it's not a big deal. Yes, she's interested in unexplained phenomena, but that's just her hobby. The book centers on Montgomery when absolutely nothing interesting happens to her in the entire book. I was exceptionally frustrated by the lack of plot in this story, but there are readers who enjoy "slice of life" style stories and who would love this particular book. I am amazed at the wide variety of Little Red Riding Hood stories that are available. 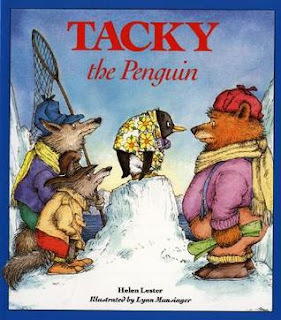 I read five books during my storytime, all of which were variations on the standard Little Red Riding Hood story, and I had over a dozen other books on display for parents to check out as well. 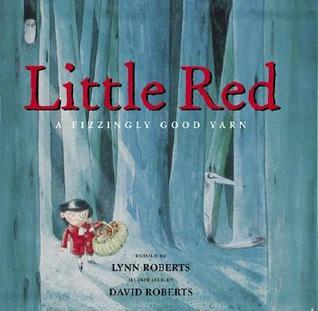 I think this first book is one of my favorites, because the Little Red character is male and he convinces the wolf that ginger ale is tastier than grandmothers. This one saw a butterfly, and he began to race. This one tried to catch his tail, and he went round and round. This one was so quiet, he never made a sound. Craft: For our craft, I found this copy of the story plus puppets. I gave the kids craft sticks as well so their puppets could be stick puppets, and the kids enjoyed coloring these puppets however they wanted. One little girl even gave Little Red a green face, "because she's the Hulk's girlfriend." One bows once; one bows twice. Waddle little penguins; waddle away. Come back penguins; time to play! One fell off, then there was one. Went home to sleep, then there were none. 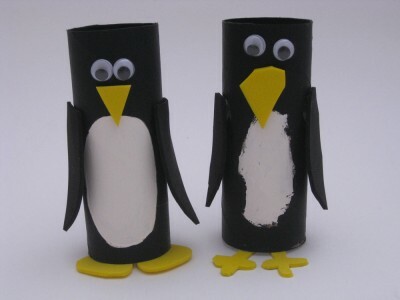 Craft: We made TP penguins. Mine looks more traditional, but I set out colored paper, and I saw blue penguins and green penguins and pink penguins. Graudin, Ryan. Wolf by Wolf. Little, Brown BYR, 2015. WWII is over. Hitler won and has taken over all of Europe and Africa. He has split Asia with Japanese emperor Hirohito, who controls the Pacific. North and South America are so insignificant that they are not mentioned in this story. Each year there is a motorcycle race across Europe, Africa, and Asia, starting at Berlin and ending at Tokyo. Ten youths from Hitler's empire and ten from the Japanese empire compete for the trophy. Yael is a concentration camp survivor who has the ability to skin-shift; she can change her appearance so she looks like anyone else. Yael is determined to enter the race, win it, and earn a dance with Hitler at the Victor's Ball, where she will assassinate him. Wow. That's about all I can say. It was so frustrating to have to put this book down so that I could work, sleep, eat, etc. The story is compelling and switches back and forth between Yael's past in the concentration camp and her current story as she attempts to survive a grueling international race. There's sabotage, back-stabbing, more sabotage, kidnapping, and of course the ultimate goal of Yael being able to get close enough to Hitler to kill him. I should have anticipated the ending, but I didn't, and I loved the surprise. My only small objection to this story is that it falls into the category of "books about a girl who has special powers and is the only one who can save her society from falling into ruin" a la The Hunger Games or Divergent. 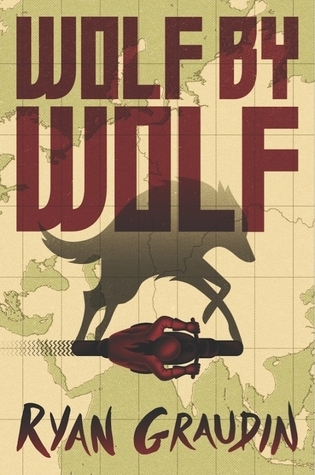 The alternate history angle is a good one, though, and it was well worth reading. Recommended. He stays out all summer in sunshine and heat. Inside the bear sleeps all cozy and snug. There is snow in the sky. And the wild geese fly. Has his fur to keep warm. Sleeping all through the storm. Craft: Hibernation caves! Cut a u-shaped hole in a paper lunch bag, then fold and staple the top shut. 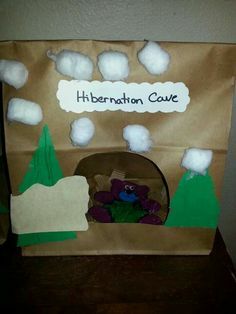 Decorate with cotton ball "snow" and fill with leaves or pine needles to make a cave for your bear. Rushton, Abbie. 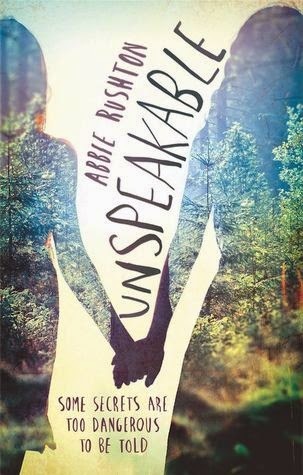 Unspeakable. Atom, 2015. Megan is suffering from selective mutism. She was an average teen until a traumatic event rendered her unable to speak. So she suffers in silence as her mom encourages her to speak, as her former friends bully her, and even as she is befriended by the bubbly new girl who doesn't seem at all bothered by the fact that Megan cannot speak. 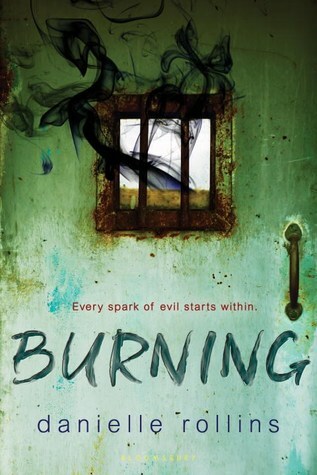 To say any more about the plot would be to give it away, but this is a powerful novel in the vein of Laurie Halse Anderson's Speak. Similar to Anderson's Speak, this was a good book, but a hard book. 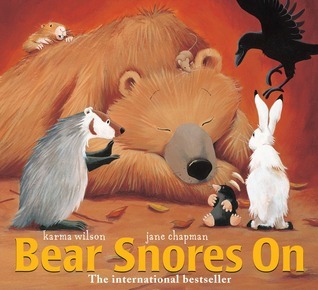 I would easily recommend this book to kids who enjoy reading books about kids in tough situations. I would put this book on my shelf because it discusses bullying and involves LGBT themes. If you haven't read this one yet, drop everything and do so immediately. Knowles, Jo. Read Between the Lines. Candlewick Press, 2015. Every chapter in this book is its own story, and each story is connected to the others. Each story features a character who is given the finger by someone else, and by the end of the story it is obvious how all of these seemingly random events connect to each other. I could see teens enjoying these individual stories, especially with the addition of the obscene hand gesture, but this wasn't a story with an obvious plot at all, which makes it difficult to describe. There wasn't much of a story going on at all, but I would still recommend this book to teens, especially those who are reluctant to read longer works and may wish to visit only one of the short stories. I would hope one of those stories would hook the reader and draw them in to the rest of the book. Hutchinson, Shaun. The Five Stages of Andrew Brawley. Simon Pulse, 2015. This was a well-done book. It reminded me a bit of the show Red Band Society. Andrew (not his real name) is friends with the hospital staff and a couple of teens who are cancer patients, and he is desperately trying not to be found. All of that blows up in his face when he falls in love with Rusty, though. 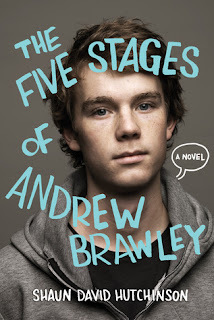 This book is scattered with pages of Andrew's comic book about Patient F. I love the way the story all fell together at the end, the way Andrew referred to the social worker as Death, and I was glad for Andrew and Rusty's relationship. 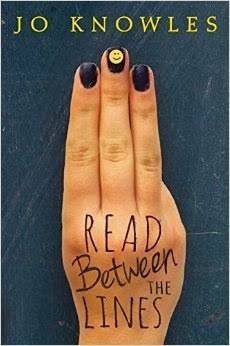 This is a good read-alike for fans of John Green. Note: This review was originally written on 1/21/15, but due to my service on the Stonewall Book Awards committee, I could not publish any reviews of young adult or children's books featuring LGBTQ characters until after the awards announcement. Brugman, Alyssa. Alex As Well. Henry Holt. & Co BFYR, 2015. Alex is intersex, but she was raised as a boy and was given testosterone to make her appear more boy-like. Now, at fifteen, Alex has decided she wants to live as a girl. She's not sure that she wants to settle on either gender permanently, as she sometimes feels as though there are two Alexes, one of each gender, living inside of her. The night she announces she wants to be a girl, her father leaves and her mother flips out. Alex has never been told she's intersex, only that she's "a little bit different." Now her mom is blogging about her experiences raising Alex while Alex is buying dresses and has enrolled as a girl at a Catholic school. 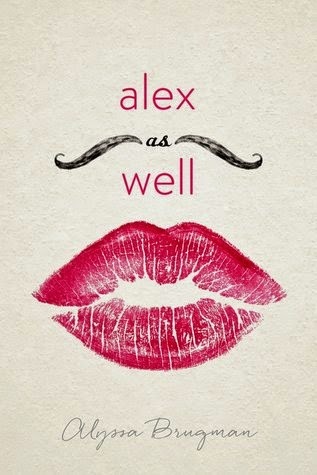 I was glad for Alex's strong voice throughout this book. She knew what she wanted and she went about getting those things. Alex is dealing both with her intersex condition and her mom's probable mental illness. Alex's mom drove me crazy, but she did the same thing to Alex. Her blog posts are something else entirely, especially since Brugman even included comments at the end of each post. I think the combination of the blog posts and Alex's story make this book an easy sell for young adults, and the inclusion of a genuine intersex character is something that has been needed for a long time. I am glad to have this book on my library's shelves to provide both mirrors and windows for my patrons. Also, I loved the ending. Absolutely loved it.